The university and department offer a number of scholarships, teaching assistantships, and research assistantships. You are encouraged to apply by January 31 in order to be nominated by the Department for these scholarships (applicants are automatically considered for these scholarships). Learn more about graduate programs. Congratulations to our graduate class of 2018! 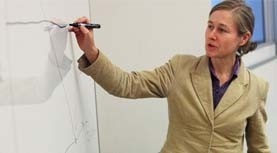 Professors in the Department of Economics are advancing knowledge in the field of economics. Take a look at the latest papers. Economics programs at Dal will take you beyond the classroom. Check out a wide variety of co-op, exchange and summer programs that will expand your learning. Canadian students can connect with Chinese exchange students, in and out of the classroom. Learn more about exchange opportunities with two Chinese universities. At Dalhousie University, not only do students learn from the best, they can also work with them. Explore research areas in the Department of Economics.